SH2-188, or the Dolphin Nebula is a planetary nebula in the constellation Cassiopeia. It is approximately 850 light years from Earth. Night sky photographer Bill Snyder took this photo from Connellsville, Pa.
Crescent-shaped planetary nebula SH2-188 glows in wisps of green in this skywatching image. Astrophotographer Bill Snyder captured this stunning deep-space image Feb. 22, 2012 at his Home Observatory in Connellsville Pa.
Sh2-188, also referred to as the Dolphin nebula, is approximately 850 light years from Earth in the constellation Cassiopeia. A light-year is the distance light travels in one year, or about 6 trillion miles (10 trillion kilometers). 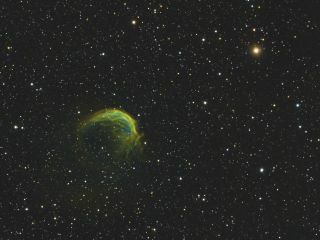 The unique, crescent shape of the nebula led astronomers to initially believe SH2-188 was the remnant of a supernova. However, SH2-188 was confirmed to be an asymmetrical planetary nebula.